discover the endless possibilities of this versatile instrument! Get the most out of your Maschine hardware and software in 8 classes by experienced Maschine users. In this Course, we will build on your foundations in software as a standalone tool, drumloops and using samples. You will take your beat and melody-making skills to the next level. 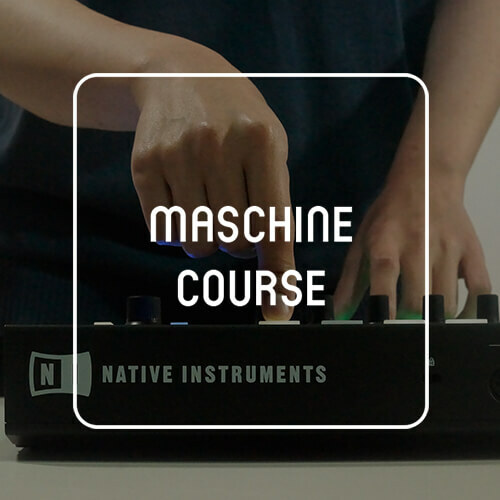 As you’ll get to know the possibilities of Maschine, you will be able to take advantage of our Native instrument-equipped classroom in your free time. We will always help you apply advanced techniques in your work and extend your own limits with the possibilities that Maschine provides. The basis of Maschine is the software and how it connects to the instrument. Besides the basic functions, you will learn how to use samples, make drumloops using groups & sounds and the use of Maschine as a standalone tool. We will also look at your music style and goals: what do you want to get out of Maschine? How can you get the most out of the instrument with the music you make? So we got the basics and personal goals narrowed down, time to think in possibilities. Techniques like the step sequencer, working with samples and using scenes and regions are a few of the tools handed to you. At the end of stage 2, you will have in depth knowledge to apply your style of music to the possibilities of Maschine. All these required elements will be used for your final assignment in stage 3. Getting the most out of Maschine also means using it with other software and hardware. How does Maschine integrate with other DAW’s, Komplete Kontrol, hardware synthesizers and third party plugins? You will also learn to use Maschine in live situations. This goes for using Maschine as a midi controller with a DJ set, as an fx unit and stand alone, focusing on what would work best for your music. As a final assignment you will produce an entire track with just Maschine. After the Course, you will be able to create and perform tracks with Maschine with optimal use of your own studio setup and all the advanced techniques you have learned. The Maschine Course start in October and in April. When you are registering for the Maschine Course, please let us know for which starting date you wish to sign up for. It is also possible to follow the Maschine Course as private lessons. For €60,- per hour, you can decide your own pace and number of lessons. Further discount options are possible if you follow a private course with a friend. Ask us for the conditions! Besides the regular Maschine Course, we also host several Maschine workshops each year. Sign up for our newsletter or contact us to be the first to know about the next one! Do you want to meet the teacher before signing up for the Maschine Course? Discussing your learning goals and music in a free intake is possible throughout the year.